Size: 1872 sq.ft. - 2462 sq.ft. Serena Casa Viva is the upcoming high quality project by Dubai Properties covering 8.2 million Square Feet and 1 lakh sq.ft of space for retail units in Dubailand. The project was launched in June 2017 by leading Dubai based master developer "Dubai Properties". Serena Community has welcomed Bellas Casa, Casa Dora and Casa Viva(New Phase), out of these two of the phases is been successfully sold off. Casa Viva is villa community is known to be the last and third phase of Serena come in sizes of 2 BED, 3 BED & 4 BED structure. 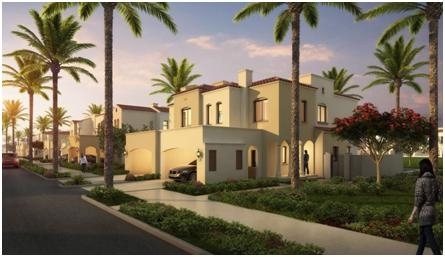 These Portuguese themed villas are smartly designed with attractive plans and prices @ AED 1,340,000. The construction of Casa Viva is due to be completed by Quarter 2 of 2020. Casa Viva is placed within the Serena master development inspired by Spanish architecture and design. The project compromises of 2 BR,3 BR & 4 BR townhouses and can be availed at AED 1.34 Million to AED 2.1 Million. The neighbourhood of Casa Viva offering sports and retail facilities, kids play areas, a large park and vast green spaces. The lifestyle of Serena development has made it most sought after destination to live in with full of attractive features. This peaceful community of Serena is settled between the area starting from 1872 to 1877 Sq.Ft for 2 Bed Villas, 3 Bed villas are available with the size ranging from 2021 Sq.Ft to 2569 SqFt and the large sized 4 Bed townhouses covering the area of 2216 Sq.ft to 2462 Sq.ft with tiled roofs, elegant detailing, 2 parking space for each villa, more than 3 Bathrooms, spacious layouts and the utmost comfort; they easily accommodate the needs of all family members. Casa Viva is set bordering with Al Waha, Arabian Ranches 2 and Layan community.At the walking distance to Sustainable City and Mudon and 15 minutes drive to Global Village, IMG World, MOE, Sports City and Motor City. Casa Viva Dubai offers stylish 2 Bedroom and 3 bedroom spacious townhouses with a separate maid’s room. The residents will have the opportunity to enjoy an array of neighborhood cafes, restaurants and retail shops.This place enjoys unmatched connectivity to all parts of Dubai. The Casa Viva is specifically designed with commercial and residential landmarks. This ideal location of Casa Viva villas allows easy entry to major road systems that put the city within easy reach in Dubai. The company was founded in 2004 by Dubai based developer. Holding more than 15 years of work experience in the real estate sector. Dubai Properties brings to the mix an in-depth understanding of the core residential needs of its tenants and investors, thus providing innovative real-estate and lifestyle solutions. Dubai Properties success story began in the year 2002 when it started operations as "Estithmaar Realty". So far Dubai Properties has delivered 40K residential units and there are more than 100,000 people living in the communities, happy and safe. The growing portfolio of the developer includes Mudon, Remraam, Serena, Al Waha, Arabella, Arabella 2, Casadora, Layan, The Villa and Villanova in Dubailand, Manazel Al Khor and Dubai Wharf located at Culture Village, Bay Avenue, Bay Square, Bellevue Towers, The Executive Towers and Vision Tower at Business Bay, 1/JBR at JBR and Ghoroob and Shorooq in Mirdif. Casa Viva is a villa project in Serena Community at Dubailand, Dubai, United Arab Emirates. These ideal homes by Dubai Properties is well equipped with modern amenities such as community pools, healthcare clinics, sporting courts, cutting-edge gyms and fitness facilities, , Hotels, Restaurants & Cafe, Petrol Stations,Private Garden, View of Landmark and water, Walk-in Closet, Balcony, Built in Wardrobes, Central A/C, Covered Parking, Kitchen Appliances, Maids Room, Supermarkets, Post Offices, Departments Stores and a wide variety of essential retail spaces to suit daily need of residents.